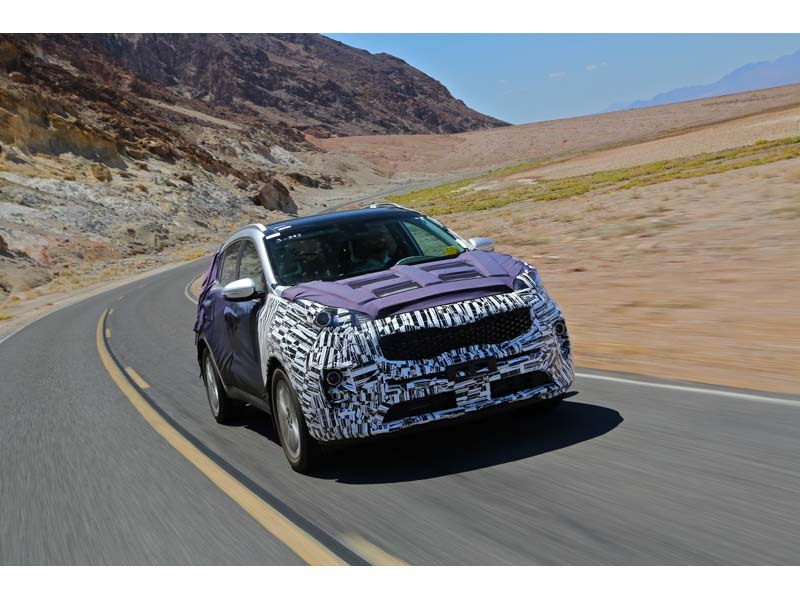 Now entering its fourth-generation, Kia's all-new compact SUV is undergoing the final stages of its development, with engineers testing the Sportage in Death Valley – one of the hottest places on Earth, with temperatures rising as high as 56ºC (132ºF) in the summer months. This stage of testing means Kia can develop cars designed to operate in the harshest environments. For the all-new Sportage's hot weather test, particular focus has been placed on developing its class-leading heating, ventilation and air conditioning (HVAC) systems. Among the various individual hot weather testing methods, three gruelling tests are often employed by Kia's vehicle test engineers, placing huge demand on the HVAC systems and the effects they have on engine and transmission cooling when used in the extreme heat. The first of these tests is the up-hill climb, in which the vehicle is soaked in the midday sun for an hour to bring the cabin temperature over 50ºC (122ºF). The Sportage is then driven from sea level to almost 5,000 feet elevation through the aptly-named Furnace Creek area of Death Valley, a steady climb over 27 kilometres (17 miles) at 100 kph (62 mph). The test is designed to ensure that the additional load placed on the engine has minimum impact on the car's ability to cool itself and its occupants. The final test devised by Kia's engineering teams for the all-new Sportage is a slow drive, which takes place at the lowest point in North America, Badwater Basin – around 86 metres (282 feet) below sea level. After another one-hour heat soak, the all-new Sportage is driven at 40 kph (25 mph) for 30 minutes at a time, allowing vehicle engineers to verify – and improve – the capacity of the HVAC system when there is a dramatically reduced level of airflow to the air conditioning condenser unit. In addition to the demands placed on the car by the extreme conditions of Death Valley, Kia also carries out a series of hot weather tests at the company's own North American testing facility – the Mojave Proving Ground. Located deep within the Californian Mojave Desert, the Proving Ground demonstrates the lengths to which Kia goes to ensure the quality and durability of every new car it creates, including the all-new Sportage. Established in 2004, the Mojave Proving Ground is around 177 kilometres (110 miles) from Los Angeles. The 17.4 km2 (6.7 square miles) center carries out extensive on- and off-road testing across numerous types of surface, and – in this notably hot, dry part of the world – the facility also enables development teams to put car materials and components through some of the most strenuous climatic conditions. The Mojave site also houses a material weathering facility, where full cars and a variety of parts are exposed for a full year to the continuous UV radiation from the California sun's intense rays. This exposure is accelerated through different testing equipment, ultimately ensuring that the various parts and components of Kia's vehicles do not deteriorate under extreme heat, and remain intact throughout the whole life of a vehicle. Engineered to meet the needs of a global customer base, the Sportage has been subjected to high altitudes, sandstorms, monsoons, congested city centres, alpine passes, and extreme weather material testing covering temperatures as low as -35ºC (-31ºF) and as high as 110ºC (230ºF). Extensive testing carried out across the world's diverse roads will make the Sportage a truly global car when it goes on sale. All Kia models undergo testing to ensure the highest possible durability in all conditions, with the all-new Sportage undertaking the company's most extensive – and intensive – testing programme to date.